Siebensachen, handcrafted & Imported from Germany. Looking for a place to store all of your mail, business cards, and pictures? In our search for functional modern design objects which can be used on a daily basis, we came across the attractive Babel desk organizer which was designed by Adam and Harborth in Germany. 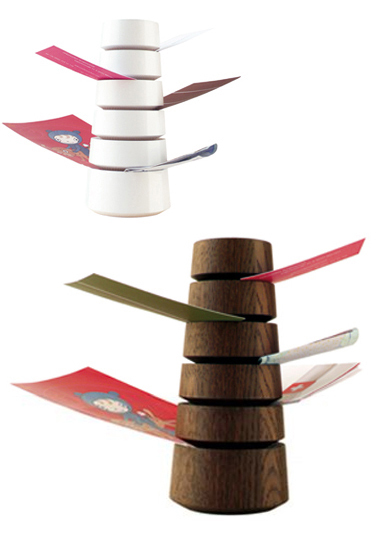 The Babel desk organizer looks like a stacked tree that you can use to organize business cards, notes, post cards or photographs. The Babel desk organizer stands 7" tall, and it is available in white beech or dark oak. This functional multipurpose desk top organizer is a perfect organizing tool to store and organize invitations, business cards, post cards, photographs, small memos, etc. This modern desk organizer combines functionalism and design into an attractive functional object for daily use. The Babel desk organizer is perfect for both the office or at home where it can be used as a savvy way to unclutter your desk. The Babel desk top organizer is presented in a gift box and makes a great unique gift.